I'm not the least bit ashamed to admit that sometimes, on an occasion or two, I've been inspired by one of the Kardashian klan (like this here shirt). I even may or may not have been an avid Keeping up with the Kardashian's viewer at some point or another. So, yeah, they can be influencers. And to my own surprise...this time it was Kylie that got me. 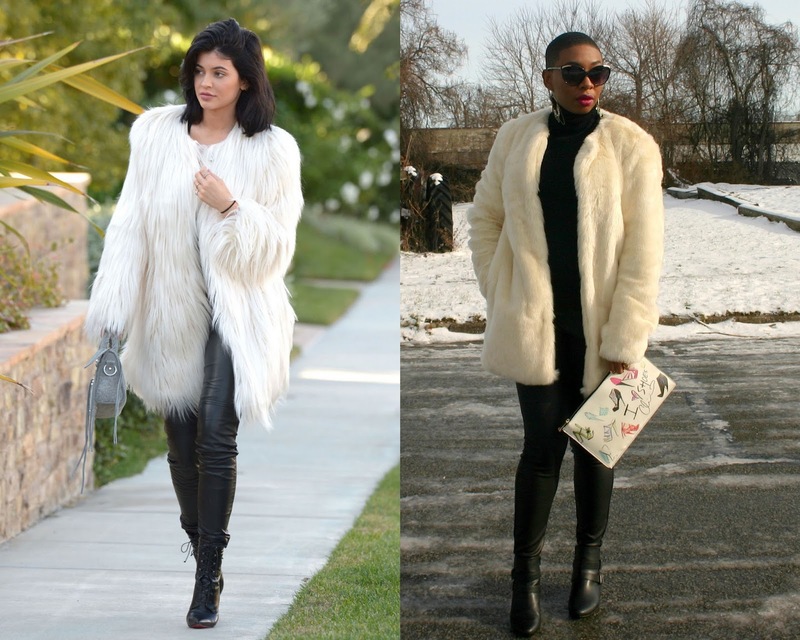 When I saw Kylie all bedecked in fur and leather it was a total "hello" moment, there's something I could appreciate about such a bold outfit choice. Now, let me preface this by saying, I didn't actually jump up and go buy a coat similar to Kylie's. I just so happened to already have it. I'd picked it up a while ago and hadn't worn it yet. I'm not exactly sure how Kylie managed to pull it off in seemingly sunny, warm weather, but mine definitely fit the bill for one of our first day's of snowfall. I think she may have gone with a tank top underneath, where I needed full-on turtleneck coverage. And since I'm not all rich and serious, I grabbed a fun clutch to wear with my furry statement coat. But this is certainly a simple way to sexify your holiday! As I type this post, I'm thinking of all the presents that still need wrapped. Which is basically all of them. Ugh...my lovely Christmas tree looks so lonely without presents.... I hope all of you are feeling stress free and ready for the holidays...because I'm not! Last week I posted a gift guide that was all about fun, affordable fur a.k.a faux fur. And I have to say I'm alllll about the faux furs. They work in fall and into winter, and make your look feel a bit more luxe! I wanted to do something a little different with color, so I went for deeper, richer tones in wine, mustard (one of my favorite shades) and forest green. Then I added a dash of fur, a touch of leopard and a splash of gold. I picked up this scarf and another one last winter, but find myself reaching for this one all the time. Then I got all inspired after seeing some belted furs on Pinterest, so I decided to give it a try myself! I have to say I'm suuuuuuper thrilled about this weather we're having in the northeast, and it can stay right on through to April! I'm not the least bit disappointed if there's no snowy white Christmas (don't hate me). Can you believe Christmas is little more than a week away?? If you haven't yet entered my Holidays on Chic Giveaway for your chance to win a glittery pair of Kate Spade earrings and some beauty goods, click HERE! Today is your last chance to enter! Good luck!! Faux fabrics are seeing a resurgence and faux fur is definitely one that is experiencing its season right now! Anything done poorly can be terrible, but times have changed since the days of my mother's faux fabrics and they can feel practically as supple and soft as the real thing! From winter whites to rich wines - today I've rounded up a few fun fur options that would make great stocking stuffers or last minute gifts and all around price points of $10!! And for the chance to grab a few gifts for yourself, you've still got time to enter my Holidays on Chic Giveaway for the chance to win a fab pair of Kate Spade earrings and beauty goods! I mean, you've been good this year too, right?! GIVEAWAY!! Holidays on Chic featuring Kate Spade!! I am grateful for the year I've had, even with all of its not so great parts (such is life, right?!). I had some amazing experiences, like getting to appear on the Today Show, and I want to put some positive energy back into the universe. Since it IS the season of giving, I'm hosting a holiday giveaway! Victoria's Secret candle in the fragrance "Bombshell"
(2) Victoria's Secret body lotions in the fragrances "Mango Temptation" and "Pear Glace"
PLEASE NOTE that this is not a sponsored post and everything in the giveaway was paid for by me. This giveaway is open to U.S. residents only. Thank you all for visiting and good luck!! !